A molecularly imprinted polymer was developed and used for solid-phase extraction (MISPE) of the antihelmintic fenbendazole in beef liver samples. 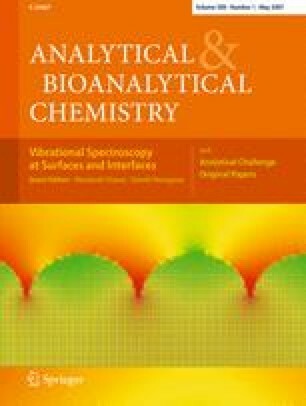 Detection of the analyte was accomplished using square wave voltammetry (SWV) at a cylindrical carbon fibre microelectrode (CFME). A mixture of MeOH/HAc (9:1) was employed both as eluent in the MISPE system and as working medium for electrochemical detection of fenbendazole. The limit of detection was 1.9 × 10−7 mol L−1 (57 μg L−1), which was appropriate for the determination of fenbendazole at the maximum residue level permitted by the European Commission (500 μg kg−1 in liver). Given that the SW voltammetric analysis could not be directly performed in the sample extract as a consequence of interference from some sample components, a sample clean-up with a MIP for selectively retaining fenbendazole was performed. The MIP was synthesized using a 1:8:22 template/methacrylic acid/ethylene glycol dimethacrylate ratio. A Britton–Robinson Buffer of pH 9.0 was selected for retaining fenbendazole in the MIP cartridges, and an eluent volume of 5.0 mL at a flow rate of 2.0 mL min−1 was chosen in the elution step. Cross-reactivity with the MIP was observed for other benzimidazoles. The synthesized MIP exhibited a good selectivity for benzimidazoles with respect to other veterinary drugs. The applicability of the MISPE-SWV method was tested with beef liver samples, spiked with fenbendazole at 5,000 and 500 μg kg−1. Results obtained for ten different liver samples yielded mean recoveries of (95 ± 12)% and (96 ± 11)% for the upper and lower concentration level, respectively. Financial support from the Ministerio de Educación y Ciencia (Project BQU2003-00365) is gratefully acknowledged.